Access to safe drinking water is one of the basic rights of an individual. Water comes to our homes and offices from rivers, lakes, streams, bore wells, and oceans. All of us expect to drink and provide good and hygienic quality water for our children and families be it at home or at office. So how do you ensure safe drinking water? Water from taps can be either filtered or treated by installing a water filter. Water softener is ideal for places with hard water supply. How will a water softener help in solving this issue? The other name for water softener is water conditioner. As the name suggests just like a conditioner a water softener helps condition the water by removing undue quantity of minerals. Once the water is clean of such excessive minerals, the water turns soft. Water softener is required in places where you get only hard water. Generally ground water is hard and it is important to know the source of your water before installing a softener. In simple terms the process of converting hard water to soft water is referred to as water softening. Hard water tends to leave scales on tiles, and taps and you may even notice your soap does not foam much. A soft water does not leave any scales on taps and faucets and you will have to spend less on soap since there are no hard minerals to cover the soap. Water softening is a process by which certain excess minerals like calcium and magnesium are exchanged for sodium or potassium ions in water. This exchange takes place in the resin tank of a softener. The negative charged ions get exchanged with the positive charged sodium chloride ions when water goes through the resin tank. The sodium swaps places with the calcium and magnesium ions. 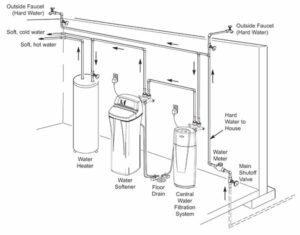 Water softener consists of a tank with tubes which run up and down in the center of the tank. The whole unit consists of resin tank and a brine tank while the excess minerals are released into the drain through a tube. Water softeners work on the ion exchange system of filtration. Water flows through the resin tank where in it comes in contact with the small beads coated with sodium ions. These sodium ions on the beads attract calcium and magnesium ions present in the hard water. The hard water ions swap places with the sodium ions. All the hard minerals get exchanged with the soft water minerals. Sodium ions are released into the water from the resin beads. This process goes on till the resin beads need to be replaced. The water controller valves at the top controls the flow of hard water to the resin beads and ensures that all hard water goes through the resin beads for the softening process.Treated and soft water is then distributed through a distributor tube to your homes. The final soft water is high in salts. The brine tank along with the resin tank forms the whole unit of a softener. You will need to fill the brine tank with salts for recharge. After continuous usage the resin beads get exhausted and contain all the minerals like calcium and magnesium on them. At this point you will need to replace or recharge the beads. During the recharging process the beads are soaked in a strong solution containing sodium chloride and water. The sodium in the solution causes the beads to release all the deposited calcium and magnesium ions. The beads are then recharged with sodium and are ready for use in the softener. Some softeners available in the market have built in timers to automatically recharge on a regular basis while some use a computer based system that studies the performance of the beads based on the water usage. One needs to remember that a water softener is not a water filter. It does not remove germs or sediments from the water. It does not make water drinkable like a water filter with reverse osmosis and ultra violet features. A softener for water will save you money on detergents and soaps all through the year. Even cleaning taps, tiles and on other surfaces will be easy since there won’t be any mineral deposits on them for you to scrub. So if you stay in areas where you receive only hard water, then it would be wise to invest in a water softener to experience the difference.